At this time of year, James Bath and Di Taylor from the Woodlore offices would normally be returning from France, after running our Canoeing in the Ardeche courses with canoe instructor Blue. However, after the major flooding of last year and the inconsistent water levels we ‘ve experienced for the past few years, we decided to run the course in September for this year. We expect that in September the weather will still be excellent, but with lower water levels, so we’ll able to paddle every day! Furthermore, with the school summer holidays over, the river should be much quieter too. This year we have revamped the Ardeche course to include evening lectures to allow more time on the water. 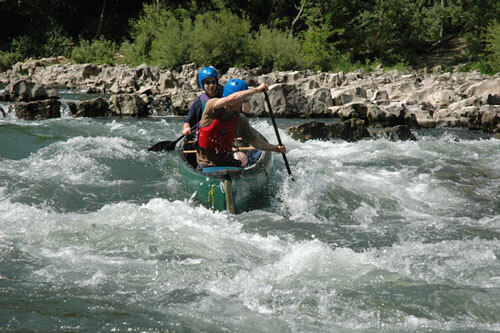 We still have some places remaining for this year’s Canoeing in the Ardeche course in September, so please visit the website and book up if you are interested to avoid missing out on this fantastic experience. We will be releasing the 2012 Canoeing in the Ardeche course dates later in the year. This entry was posted in Bushcraft Courses & Expeditions on May 27, 2011 by Woodlore Team.